Gnarly River: Day 97 : Mazama! Woke up a little later than usual and hit the trail after the sun came up. I hike to Mazama, the campground in Crater Lake National Park. I pass through a large burned area. I'm glad it's morning and I'm not in the sun. I really enjoy walking in the early morning. As I hike I think about how much I give up to be out here doing this. Constantly dirty, living in squalor, taking down and setting up my tent home every day. This is a hard life. I'll be glad to complete this journey being able to do what I said I'd do. I arrive at highway sixty two around noonish. Helicopters have been flying overhead all morning. 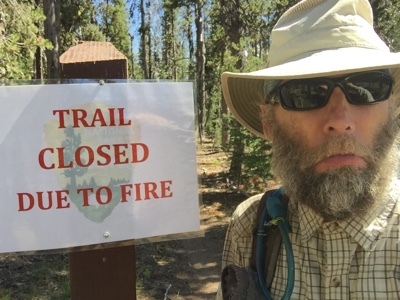 I get my first official notice that the PCT and the Rim Trail are closed with a trail closed sign on the PCT trailhead. I've heard rumors that this was the case but now that it's official I can plan for an alternative way to walk from here to Canada, getting back to the open PCT north of here as soon as possible. I hike on past the trail closed sign and turn down the Annie Springs trail to Mazama. It takes me awhile to figure out how to get to Mazama when I reach the road. The trail appears to turn down to the spring. So I turn down there. Then it looks like it might continue on down the stream and under the bridge. Then it becomes super narrow on a really steep hill. This can't be right. I scramble through the bushes up the hill and find that I should have simply crossed the road. I arrive in time for lunch at the restaurant. I sit at a table with my pack occupying the seat across from me. It turns out that my pack can be a good listener. I ignore it and look at the map I bought of the park. It turns out that the alternate route is a walk on the east rim road. It's a long winding road. Twice as long as the rim trail. Twenty five miles around. No water sources. Looks like a tough time. Once around to the other side there is sixteen miles of trail before the first water source at Thielsen Creek. On a happy note, my bacon cheeseburger delicious. On a less happy notes heir ice cream machine is broken, no milkshakes. After lunch I head over to the store. They have my box of food, yay! I check to see if they have fuel for my stove, nope, Boo! I wonder if I'll have enough fuel to make it to my next resupply, half a bottle? I take my box and my pack and head over to the PCT hiker camp. It's really a great camp. Lots of trees, lots of small nooks and bowers between them. I find an isolated shady spot away from others and setup my tent. I climb in my tent with my box and sort and pack my food. I have two extra dinners because of the faster pace I've been traveling, six instead of four. I really don't want to carry this extra weight. I estimate that if I can keep this pace I'll be at Shelter Cove in three days. So four days of food is a conservative maximum number I need. So for the first time I choose a couple of my cherished dinners, an instant breakfast, and a Starbucks vanilla latte and put them in the hiker box. Some hiker’s going to score big time. This lightens my pack in preparation for my big road walk tomorrow. Then I head to the shower and take a hot shower. The shower is free with all the hot water I want. I sort through my clothes and decide to do some laundry. The store sells a single load of soap for seventy five cents. Remy, Pierre, and Max and doing laundry too. Anthony is here along with a bunch of other hikers. Soon more show up. A large mob of thru-hikers. I have dinner with Smoosh, Wisecrack, and Shaggy. Yes, Shaggy looks like Shaggy from Scooby Do. I learn a lot more about the social scene of the PCT thru-hikers from them. They spend a lot of time with packs of hikers. All hanging out and camping in the same places. I feel fortunate that I have been able to not be caught up in a pack. I think that might be changing as there will probably be a pack going forward. Some will shuttle around the road walk. This will put them in front of me and I'll be hiking into the pack instead of away from it. It's all part of the adventure I guess. I see Batdance and Rockbiter while walking back from dinner. They are planning on road walking too. I meet up with them after they set up camp and we talk about plans for tomorrow. This leads to us walking back to the store where the map with the closed trails on it is posted. While looking it over, Devil Fish shows up and tells us where we can find water. He also says there's a shuttle you can take to skip about fifteen miles. Batdance and Rockbiter elect to do that. I will probably be walking alone. But now I know where I can find water. We end up hanging out and talking way past hiker midnight. I head back to my tent in the dark and climb inside. Unfortunately a mosquito followed me and I spend a long time trying to kill it in the dark while it intermittently sneaks out from its hiding place and bites me again. Arrgh! On a happy note, my bee sting seems to have gone away. I wake up in the middle of the night. My stomach feels weird. Food poisoning? Lot of gurgling going on. I had onion rings with my salad bar dinner. One of them had batter that wasn't cooked all the way. I ate it all anyway. Was that bad? Maybe something in the salad. I shoulda had the pot roast, something fully cooked. Oh man, what happens if I start having stomach cramps. Scratch that, I know what happens. Wrong question. What do I do if I start having stomach cramps? In the past it comes on all of a sudden and I have to rush to the bathroom, the big question being “Do I sit or kneel?” I'm about an eighth of a mile from the nearest toilet. I picture myself laying on the concrete floor in the ‘comfort station’. Not pretty. It's cold too. Should I get up and get dressed and walk there in preparation so when it happens I'm already there? Is that a stomach cramp? Nope, I'm tense with anticipation, try to relax. Maybe just find some place in the forest? That would be nasty and gross. I never thought about being sick in the woods before. It will be horrible, even in an established campground like this one. I lay in my bag doing nothing. Gurgle, gurgle… I fall asleep.